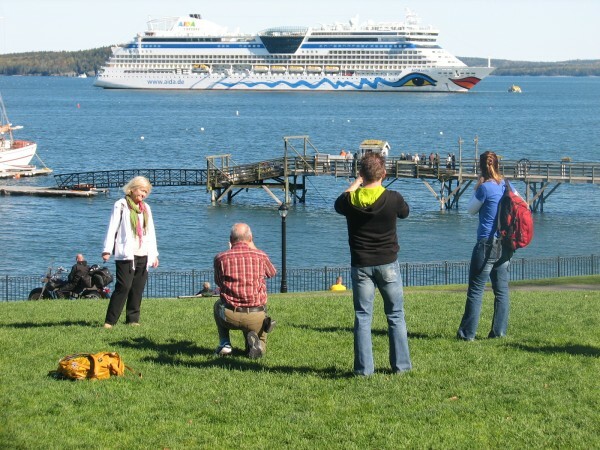 Tourists in Bar Harbor take pictures of the cruise ship AIDA Bella anchored offshore on in October 2013. BELFAST, Maine — Every year on Memorial Day weekend, Maine’s coastal communities shake off the sleepiness of the long winter and spruce up for the arrival of the summer tourists, whose dollars help fill the coffers of local businesses and keep many Mainers employed. This year, despite the cooler-than-usual temperatures and an abundance of rain leading up to the holiday weekend, is likely to see more visitors than any time since the Great Recession began, according to state tourism officials and the 2014 travel forecast from AAA Northern New England. That agency predicted that 36.1 million Americans will take a trip over the long weekend, the second highest forecasted volume of travelers since 2000 — and a number that is music to the ears of people like Greg Dugal, executive director of the Maine Innkeepers Association. Tourism is big business in Maine, where the 30 million visitors who came to visit its lighthouses, rocky coastline, quaint communities and pine tree forests last year generated more than $5.23 billion in revenue. The industry also supports more than 88,500 jobs in Maine, or about 13 percent of all employment. “Maine is open for business and tourism is big business in Maine, no doubt about it,” said Doug Ray, spokesperson for the Maine Department of Economic and Community Development. Some of the first seasonal tourists to arrive in Belfast were lounging Sunday in the afternoon sunshine that brightened the waterfront. Louis Pearson of Boston had spent the day zooming around Belfast Bay with his family in a sturdy Zodiac craft. They came to Maine to camp at Camden Hills State Park and to go boating, he said, and even though it was chilly on Sunday morning, they were enjoying themselves. A short walk up Main Street, artist Luiza Brown was manning the cash register at Harbor Artisans gallery. She said that she had visitors on Sunday from as far away as Hawaii and Texas, which was great news after a rainy spring that had taken a toll on early tourism numbers. “Today there’s lots of people out. It’s good,” she said. Dougal said that there’s a good chance that the numbers of overnight visitors to the state this year could generate $800 million in lodging sales. “That would be a record-breaker,” he said. Big draws to Maine this year include the new Nova Star ferry from Portland to Nova Scotia, new hotels in Portland and the World Acadian Congress in Aroostook County. “That’s going to bring in 50,000 visitors,” Ray said. But hoteliers can’t just rely on popular attractions, Dougal said. One major change that’s happened recently in the state’s hospitality industry is the growing importance of social media. “Everybody has the opportunity to be a critic, and they exercise that,” Dougal said, adding that one bad review on a website such as tripadvisor.com or yelp.com could cause a significant drop in ratings. Now, in addition to the usual work of a hotelier, that person must pay close attention to user reviews. “It’s a pretty daunting task, to be honest,” he said.